The band continued to grow fairly steadily and, with exception of a notable 86 members in 1930, seemed to average about 60 to 70 members from 1925 to 1932, after which membership dropped back down to 20 to 30; this may have been due to the Great Depression. [iv] The band continued to perform in this vein until the arrival in 1935 of a new Director of Instrumental Music, Robert B. Fearing. Mr. Fearing essentially created the marching and concert bands as separate ensembles by dividing the band a military unit and a concert unit, all with West-Point-style uniforms. The military band was comprised of about 95 members by 1936. Women were invited to join in 1943, and in 1944 control of band was passed to Allan H. Bone. Information provided by Kristin Sourbeer, Duke Class of 2010, Duke Band President 2008-2010. [i] Trevarthen, R.R. and Paul Bryan. PB, Who He? Trevarthen Music. 2008. Chapter V: The Duke Years--1951 - 1988. p.47. [ii] Duke University Marching Band Records, 1958- 1978 and undated. Retrieved from the University Archives. 13 November 2008. [iii] Trevarthen, R.R. and Paul Bryan. PB, Who He? Trevarthen Music. 2008. Chapter V: The Duke Years--1951 - 1988. p.47. [iv] Duke University Marching Band Records, 1958- 1978 and undated. Retrieved from the University Archives. 13 November 2008. [v] Trevarthen, R.R. and Paul Bryan. PB, Who He? Trevarthen Music. 2008. Chapter V: The Duke Years--1951 - 1988. p.48. [vi] Trevarthen, R.R. and Paul Bryan. PB, Who He? Trevarthen Music. 2008. Chapter V: The Duke Years--1951 - 1988. p.47. [vii] Bryan, Paul. Duke University--Former band director and Professor Emeritus. Phone interview. November2008. [viii] Henry, James. Duke University--Former band director. Written questionnaire. November 2008. [ix] Pyatt, Tim. Duke University--Alumnus and University Archivist. Personal interview. November 2008. [x] Henry, James. Duke University--Former band director. Written questionnaire. November 2008. [xi] Sprecher, Janet. Duke University--Alumna. Written questionnaire. November 2008. [xiii] Odell, Davin. "DUMB sports new uniforms, works toward classier image." The Chronicle. 14 September 1977. [xiv] Pyatt, Tim. Duke University--Alumnus and University Archivist. Personal interview. November 2008. [xv] Bryan, Paul R. and James D. Henry. Letter to incoming freshmen about the Duke band program. 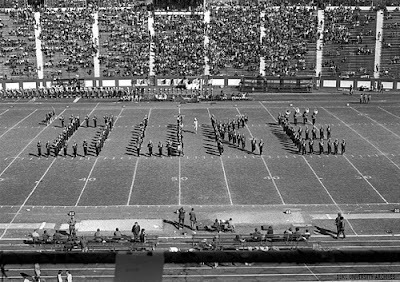 Duke University Marching Band Records, 1958 - 1978 and undated. Retrieved from the University Archives. 13 November 2008. [xvi] Boumpani, Neil. Duke University--Former band director. Written questionnaire and phone interview. November 2008. [xviii] Au, Jeff. Duke University. Personal interview. November 2008.